🙂 3xS is my shorthand for the name for this quilt: Stars, Squares and Scraps. It was the only thing I could think of, so I’m leaving it, lol. Looks fantastic .. I love scrap quilts. 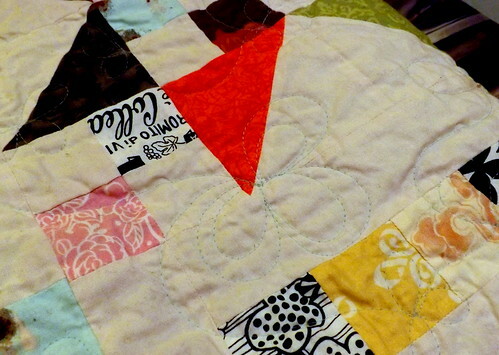 Love the clover quilting – looks fun! I don’t live very close to any of the shops here that rent time on their longarm machines, but someday I’d really like to try one out. I’m in love with machine quilting on a frame! I keep trying FMQ on my domestic, but it’s not a fan. Eventually, I might master it, or I might just figure out a way to get at least a mid-arm machine into my home. Unfortunately, it’s not feasible for me to rent time on a longarm either. I’m just lucky to have a friend who doesn’t object to me using her mid-arm frame. If it weren’t for that, all of my projects would stop at the top phase and go no further. What a great use of scraps! It makes you want to move in close and check out each individual piece. Thanks for linking to TGIFF! 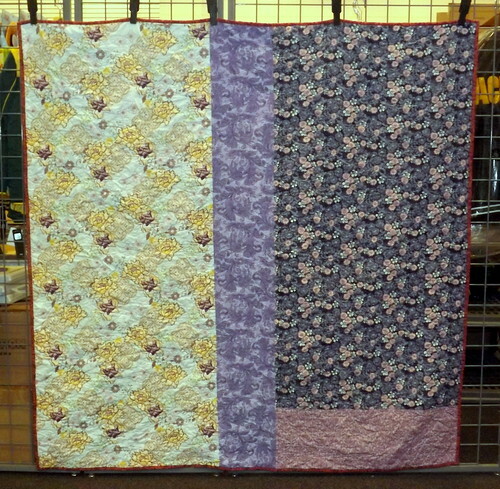 I love scrappy quilts! I’ve got another one planned – I still have plenty of scraps to use. 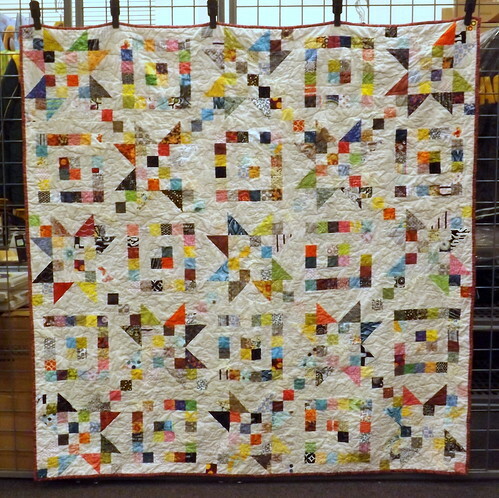 Lovely scrap quilt, with depth! Well done! Thanks so much! I had a lot of fun with this quilt. This is a beautiful quilt, I too love how some of the pattern blends into your background. Also your quilting is a nice compliment to the design. Thank you! I wasn’t sure at all how this would work out, but I’m really happy.